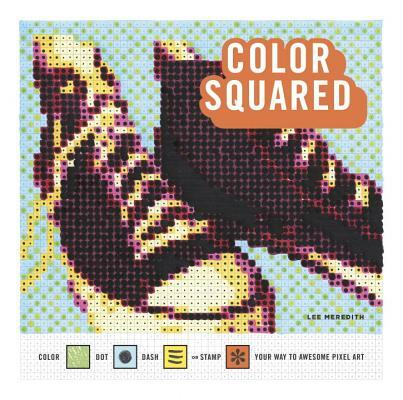 Paint-by-number meets the traditional coloring book in this brand new format that showcases pixelated images of cool and quirky nostalgia objects. Doodlers, artists, and puzzlers alike will enjoy this new take on coloring. With a focus on old favorites, pictures of things like cassette tapes, a rotary phone, and roller skates have been pixelated and rendered as numbered grids. To fill them in, users have options to vary the colors, just vary the shading, or even use different shapes or lines. Color Squared can relieve stress or challenge the mind, depending on the approach the reader chooses--but either way, it will keep the head and hands busy, and make for a fun trip down memory lane. Lee Meredith calls herself a maker of things, doer of stuff; with a background in art and photography, a career in knitting pattern design, and a later-in-life education in graphic design, she has undertaken countless projects in the worlds of craft, art, and design. She brings her love of color, puzzles, and experimentation into her creative work, known for designing knitwear with unusual construction and often with game-like twists on the process of knitting itself, and thinking outside the norm in all pursuits.